One of my favorite pictures of my ancestors is that of my maternal great-grandmother, Mary Ellen (Fralick) Hope (1852 – 1935). She married Leander Gordon on the Fourth of July in 1868 and had one daughter before he died. She then married Michael William Hope (1840 – 1919) on September 30, 1874. Michael had immigrated from England as a 6-year old boy. Of their four children, the youngest and only son, Monroe, is my grandfather. 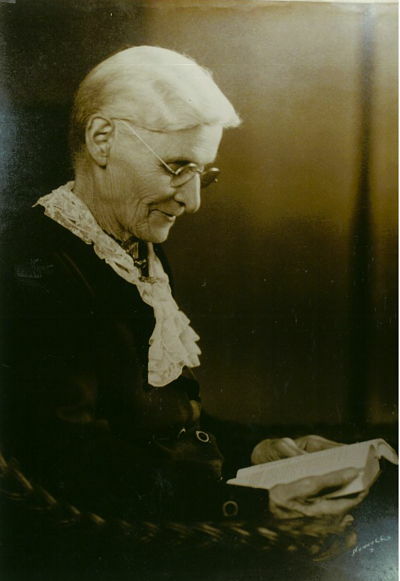 Mary Ellen was born in Grant County, Wisconsin and, except for a time that she lived with her daughter, Olive, in Kenosha, WI when she was in her latter years,* she spent her life time in Grant County. Her father, Henry Fralick (1812 -1896), was born on this day in 1812 in Montgomery County, New York and was christened May 31 , 1812, about three months after his birth, at the Reformed Dutch Church in Fort Plain, Minden Township, Montgomery, New York. As a young man he left New York and settled in Grant County, Wisconsin to farm. 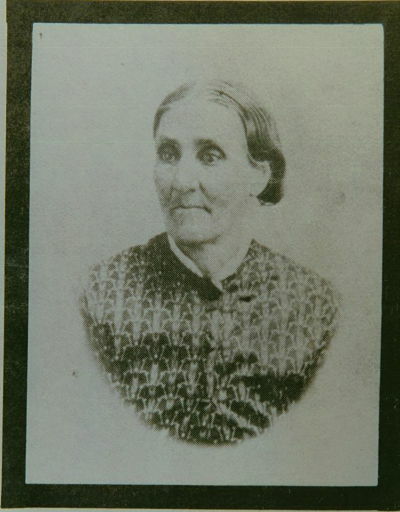 On Dec 4, 1844, he married Martha Scott (1819 – 1880) who had moved to the county from Ohio with her family. Grant County in is southwest WI, with the Mississippi River as its western boundary. The 1895 plat book shows the river and where the Fralicks farmed. 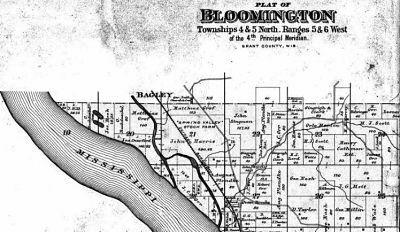 Grant County Plat Book, 1895. An “80” and a “40” farmed by Henry Fralick, highlighted in blue. 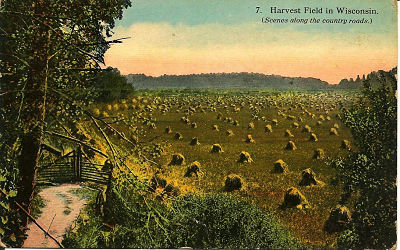 Hayfield in Wisconsin circa 1915. Farming 120 acres was an impressive feat in the 1800s. They were among the larger farmers in the county with that much acreage. As they expanded their farm, they also expanded the amount of help needed to run it. The 1860 U. S. Census had Henry and Martha living there with their six children, Charles, Martha, Mary Ellen, David, Edward, and Frank (ages from 13 to 3). Ten years later, according to the 1870 U. S. Census, the value of their real estate had more than doubled to $3000 from its worth of $1400 in 1860. Their personal estate had tripled from $300 in 1860 to $900 in 1870. Additionally, in 1870, when Henry was in his late 50s he had more help on the farm. His oldest son, Charles, was 24 and living on the farm, presumably to help with the work. They also had two male farm hands living with them, ages 19 and 21, as well as a 12-year old white, female domestic servant. The two older daughters had married by 1870 and moved out, but Henry and Martha still had several school-aged children living at home. There were also four pre-school aged children, two with the last name of Ward and two with the last name of Haggard living in the household. 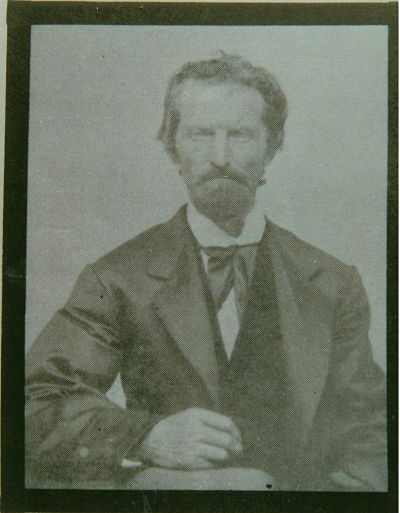 At this point, their daughter Martha Jane had just married John Reynolds (and they spent most of their adult lives in Soldier, Jackson County, Kansas) and Mary Ellen was married to Leander Gordon. A mystery yet unsolved: why were these four young children living with them? Henry died on Christmas Day, 1896; Martha preceded him in death on July 2, 1880. The cousins, both named Henry Fralick, both born on 27 Feb, 1812. According to research on Archives.com, in conjunction with Family Search International, Henry’s father was Johanes and his mother was first name was Nancy. Apparently, Johanes’ brother, Abraham, had a son born on the same day, Feb 28, 1812. He and his wife, Maria, also named their son Henry. Hello I ran across you web site today. Very nice. I notice that you credit Abraham Fralick and Maria Keller as the parents of your Henry Fralick. I do not think that’s correct but you’re in the same general family. Two brothers had two sons named Henry on the same day. I believe your Henry is the son of Johanes and Nancy Fralick. New York, Births and Christenings, 1640-1962 on familysearch.org. When I visited Minden New York to go through the records we noticed the two births. Also Henry Fralick son of Abraham is a well documented person in Michigan history and he was a Michigan state senator serving in 1850. He was also the brother of my 3rd. great-grandfather Peter Fralick. On a cool note though I have found anouther cousin. If you have any questions you can email me at hurle8@roadrunner.com. Thanks. Thank you for this information. I will get to work checking it out and making corrections as necessary. Thank you for the invitation to contact you. I expect I will! I’m glad you found that information. At least I know I wasn’t crazy! How fascinating that the two Henry’s were born on the same day. When I visited New York I got to see records that were typed by the WPA, the originals have been lost. I wish I could find proof who Johanas and Abrahams father was. Has to be out there somewhere. I love getting to meet new cousins! Thank you for reaching out.